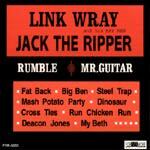 This CD contains a cross section of Link Wray's output for the Swan label. He's just such a monster legend - and his performances live up to even the most amazing water cooler rumors of his guitar wizardry. Where others rely on flash and dash, big hair and egos, and insanely boring noodling, Link employs long leaning notes, sustain, raw emotion, and exquisitely simple melodies. When you're not hidin' behind all that volume and distortion and a flurry of mindless notes, your must rely on your talent. Link is as fine as it gets in that arena. A fine cowboy number with a great melody and rolling drums. It brings up images of Gunsmoke on a good day. It's chunky and spunky and fun. Mr. Guitar is a rocking fifties guitar track, with pumpin' infectious drums and a spiffy little riff line. The damped mid section is way cool. damn fine party playtime music, and it even sports a few swimming whammies. This'll carry you down the road with the top down in that old Chevy Nomad. Another surf track from the Linkster, this is melodic and shimmering, using vibrato and reverb for a rich tone. It is very pretty, as well as full. A great track. This is a bluesy number, mostly a jam with cries of "Deacon Jones." An R&B progression, this could have been aired by the black stations of the day, and would have fit right in. Cool track. The guitar break is very chicken bop sounding. Southern fried soul. With a guitar line that hints of Kisses Sweeter Than Wine or A Taste Of Honey, this bouncing rocker plays happily in the sandbox out back of the sock hop. A funky almost Travis Wammack meets a surf band track, not very interesting. Fun and infectious. This is one moody number. The organ mourns some unseen loss while Link's reverbed guitar lightly damps out a surf rhythm at a galloping meter. This is one of those really simple tunes that makes you realize what it takes to create really effective instro rock. Haunting and powerfully distant images of sadness. The organ is so eerie, and the guitar is pure surf - damped reverb and double picked. This is a rhythmic and infectious track. Is there another instro up to the power or importance of "Jack The Ripper?" I don't think so. I still vividly remember the chill I felt (there it is again) the first time I heard this record. Even on cruddy little table radio, this stood the hairs on the back of my neck on end. This is a powerful and ominous recording, with its rolling rhythm and tom tom cadence, and intense guitar tone. It dominates you as you listen. It is as essential as it gets. Issued in 1961, it has inspired and been covered by countless guitarists. It is dark, brooding, mysterious, and the vibrato is superb. This timeless melody personifies the ability of voiceless rock to convey an image, even more than "Rumble" does. It is simply superb. Slow and methodical, "Rumble" inspired, cool club backtrack, and just like "Ace Of Spades" without the "Treat Her Right" rhythm section. Ominous and so-cool this way. If this isn't the first chicken scratch record, it's damn close to it. If any record defined the Planet Rockers-Los Straitjackets-Eddie Angel sound-to-be, this is it. Fast, chicken pickin' cluckery, grindy edge, and intensely hot guitar magic in a simple structure that just plain grabs you. remember, this is 35 years old. This was a good idea, but it doesn't have the magic of other Link Wray tunes. It's low down and growly, but not quite spooky, and not large enough for the title. Still, the dark sax and lumbering pace do create a certain lizardry. No ringing bells, not British themes, just ringing chords and a very fine bass line. This sneaks up on you, being easy to dismiss in the first few bars, but at some point around the third verse, you find yourself sucked in. Fine throbbing rockin' stuff. The bass melody is really nice. The LP version of rumble employs ringing chords instead of grinding ones, and has a dominant rhythm guitar that is different than the single version. It is much less ominous and much more relentless. Grindy dark progression based gang fight music, with great double picked attack in the middle, plus cool piano work. Even though this original take is really good, I have a soft spot for the Nobles' cover. The Neil Hefty television theme song chunka chunka'd to a certain relentless grind. Too repetitious for me. Acoustic rhythm guitar and a fifties backtrack, with a light weight electric lead and not much melody. It's an infectious fifties progression thing. A "Rumble" inspired song that doesn't quite have the same ominousness or infectious sound. It's a bit to progression oriented for my tastes. "Ace Of Spades" appeared in Pulp Fiction. This often covered tune is slow and evil, and is essentially Deacon Jones and Fat Back combined. Groovin' R&B rumble rock. Grindy and damp. Opening with the classic instro lines from the old time radio show, this dark brooding Rumble like number uses big ringing chords, sustained and distorted, and a thundering tribal backtrack, with evil laughs interspersed. A very slow pained and evil number. The lumbering pace gives it more darkness, as do the rhythm sections relentless runway grind. Quite nice.